I received an email early this morning that read, “Blessed Feast of St. Benedict!” Yay. St. Benedict is my man. Party on, Schmidts! Wait, what? I thought his feast day is July 11. So I turn to my favorite monks’ website and learn there are actually two feasts of St. Benedict on the calendar for Benedictines. On March 21, they celebrate the Transitus of St. Benedict, meaning his death or passing from this life to eternal life. This is the day the Church traditionally celebrates saints’ feast days. As I suspected, St. Benedict’s feast day is on July 11 according to the universal Church’s calendar, primarily because March 21 usually comes during Lent. The Benedictines have been given permission by the Church to celebrate one day as a solemnity and the other as a feast. Each monastery makes that decision, and many celebrate the solemnity today and the feast in July. Confused? I am and nowÂ have a ton of questions given we just celebrated St. Patrick and St. Joseph this week. Time to play Sherlock and get to the bottom of this. All confusion aside, today seems the perfect day to share another Soup & Stories entry. Let’s call it an official-unofficial entry. Margaret Rose Realy recently shared her own soup and story for St. Benedict’s Soup over at Patheos.com. If you’re looking for a way to honor St. Benedict today (or as soon as you can make a grocery run), check out her recipe for St. Benedict’s soup here. With leeks and potatoes, it makes for a great recipe during these Lenten days. Wah-wah. That’s right kid. No fun here. Ever. All Jesus, all the time. Thank me when you’re in Heaven! Then came March 19, the feast of St. Joseph. Boy was that a great day. First the kids and I headed over to Des Moines’ south-side to the St. Joseph Altar Celebration at the Italian-American Cultural Center of Iowa.Â Italians in Iowa, who knew? And what a fantastic party they throw! This event will remain on the calendar in future years. Here are a few photos from the event. Then there was this outing on Wednesday evening. Too much fun for one day! All this fun stuff this week, it kind of felt like we were cheating on Lent. A friend mentioned that if we feast it up during Ordinary Time, then by all means, feast it up during Lent. However, if you don’t celebrate feasts during Ordinary Time, well, then, you might want to skip the parties during Lent, too. I think that’s a reasonable approach. Thanks for dropping by. Stop back tomorrow when Diana von Glahn, The Faithful Traveler, shares her Soup & Story post tapping into her Mexican heritage. It’s a good one! 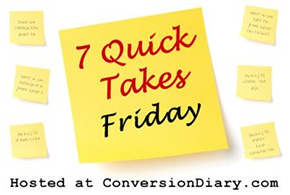 Have a great weekend!Â For more Quick Takes, visit Conversion Diary!